Alex Song ‘s outrageous and flamboyant clothes and hats have been calling much attention as well has his impressive play style creating a formidable impact for his new club West Ham. 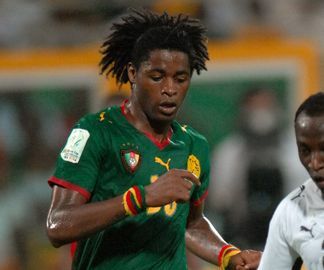 The Cameroonian international faced a dismal spell at the World Cup in Brazil and was suspended by FIFA. He was equally an irregular player for Barcelona through out the season. His transfer on loan from Barcelona to West Ham is seemingly a smile back to glory . West Ham boss Sam Allardyce has been elated with his outstanding performance. Song’s ability and witty command at the centre of the field enabled him to become Man of the Match against Manchester City last Saturday . The West Ham manager likened Alex Song to Yaya Toure. ‘He links everything together really well. We’ve got a player of the highest quality who’s played for Arsenal and Barcelona in the Champions League”. Said Sam Allardyce. Alexandre Song has a huge penchant for glitz , glamour and style. The Cameroonian soccer player has unveiled his clothing line ”Systeme Tchakap”. Tchakap refers to an African way of life, living with a certain freedom and independence. Aboutrika. 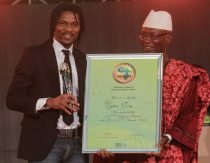 The only consolation is Rigobert Song getting the Legend Award and his nephew Alexandre Song making it into the CAF 2012 best 11. Barcelona’s Cameroonian player Alexandre Song is poised to reach a new milestone in his career. After a timid start to his now blooming career with French side Bastia, Arsenal and Catalan giants, F.C. Barcelona, the young Song could join African and Cameroonian football legendom if he wins CAF”s African player of the year award for which he has been nominated in the category for overseas – based players. Alexandre Dimitri Song Billong is the only Cameroonian to have made the top ten list that includes a strong Ivorian contingent with guys like Gervinho, Drogba and last year’s winner Yaya Toure. This reality leaves one wondering if appearing in the list is the best Song can do or does he have the grit to outplay the other nominees. Come December 20, the answer to this question will be known during the annual CAF Award gala that will take place in Ghana. The other nominees are Younes Belhanda (Morocoo – Montpellier), Pierre Eymerick Aubameyang ( Gabon – St. Etienne), André Ayew (Ghana – Olympique Marseille), Mikel Obi (Nigeria – Chelsea), Demba Ba (Senegal – Newcastle), Chris Katongo ( Zambia – Henan Construction). Is something wrong with this list or what? Where Eto’o at? Don’t wanna start a controversy, just asking. In the category for best African player based on the continent, Cameroon’s Esperance de Tunis striker Yannick N’Djeng made the cut. The 22 yr old scored 15 goals this season, helping his team to win the Tunisian league title. The other nominees in this category are from Egypt, Tunisia and Congo – Kinshasa respectively. After playing spectator for two matches since signing, Alexandre Song finally got the chance to play for his new side F.C Barcelona. This was during the return leg of the Spanish Super Cup. Unfortunately for him, it was not destined to be a dream start as his team sank 2-1 to rivals Real Madrid. He did put up a good display during the 15 minutes he spent on the field after coming in for Sergio Busquets. However, that wasn’t enough to change the tide in their favour. Since trophies were one of the reasons he signed for the club, this defeat must resonate deeply with the player since he was this close to winning a trophy barely two weeks after signing a five-year deal. Courage Mbuom. SPORT: ALEX SONG’S MOVE TO FC BARCELONA SEALED ! Cameroonian prolific midfielder Alexandre Song has acquiesced in moving to Barcelona for a five-year-deal at the transfer fee of 19 Euros, a weekly wage nearly double from the £55,000 he used to earn at the Emirates Stadium. 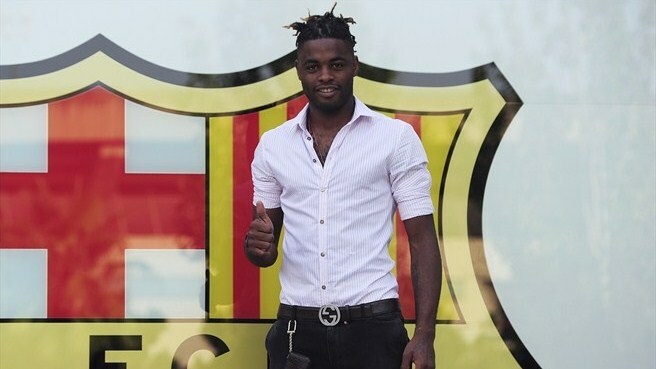 Alex Song, a product from SC Bastia youth team moved to Arsenal on loan before sealing a permanent deal with the team. He is the seventh African soccer player to join the Catalan giants. His transfer to FC Barvelona shall absolutely ignite Cameroonian’s dying passion for the club after the departure of Samuel Eto’o. Alexander Song has not been expelled from the Lions den amid rumours that he was sacked due to a falling-out with the team captain , Samuel Eto’o . He remains a member of the team.It was also confirmed by the Fecafoot media officer ,Junior Binyam that Alex Song is suffering from an injury which won’t permit him play against Senegal. “He was therefore allowed to leave while the rest of the team continues preparation. He was never sacked from the Lions’ outfit like some rumours have had it.” Said Junior Binyam. Hmmm ! Arsenal midfielder , Alexandre Song has finally revealed why he changed his hairstyle to blonde. In an interview on Arsenal TV, he explained that since his wife had noticed too many players with dreadlocks on the pitch , she asked him if he could change. He wasted no time to grant the wish of his childhood sweetie by going all blonde. ‘I was at home and my wife told me you need to change because when I watch the games I see so many players with dreadlocks, you just need to change. And I agreed. That’s why I tried something different. I like it but I want to go straight back to my dreadlocks because that’s me, the dreadlocks, although right now I just want something different. I feel the new hairstyle has made him more combative and offensive than before. He scored last week against Manchester United. Inter Milan yesterday secured a difficult 2-1 victory over Udinese in their second league outing. After Lucio opened scoring, Cameroon striker, Samuel Eto’o scored the rebound of a penalty saved by the Udinese goalkeeper, Handanovic to give the 2-1 lead. Raphael Benitez earned a 0-0 draw in his first Italian league outing against Bologne . In France, Cameroonian international, Gaetan Bong of Valenciennes scored the equalizing goal against Lyon. Aboubakar Vincent and Jean II Makoun did not play. In England, Alexandre Song scored the 3rd goal in their heavy 4-0 victory over Bolton. Did Alexandre Song fight with Eto’o ? Rumours have widely spread that Alexander Song had a brawl with his captain Eto’o and has a misunderstanding with the coach. This release coincides with Agence France Press (AFP) quoting the president of FECAFOOT: “Whatever the problems between the players, I do not think one has wanted to betray the country, not to do his job. ” Iya Mohammed has also added “we do not need to be friends to play football and we do not ask them to go away together on vacation. But assuming that clans actually exist, the team is above personal issues. It is clear that other factors, including the reprehensible state of mind of the player will not plead for him. It would be recalled that last March, against Italy in Monaco, he openly showed his displeasure at the non-call of his uncle Rigobert Song. Moreover, his relationships with several national team players was rather strained and his attitude on and off the field is far from perfect. Like when he asks one of his teammates, older than him in national team, to get up from ‘his’ place in the bus. Surely the football specialists agree on one thing: Alexandre Song Bilong remains a centerpiece of the device of the Indomitable Lions. As proof, his absence against Japan, June 14, at Free State Stadium in Bloemfontein, has left a great void in the midfield. 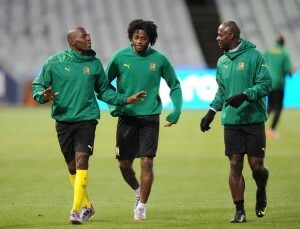 The Cameroonian authorities present in Durban held a working meeting with the technical support. According to sources close to the team, the player at the center of the controversy could begin the match on Saturday against Denmark in Pretoria. Samuel Eto’o declared on infosport in an interview that he did not have any brawl with this team mate Alex Song.